This is a very hard one to choose because a lot of Gaslight lyrics are very poetic and leave the window open for interpretation. But I gotta go with the line in Too Much Blood that goes, "I am no angel, but I got nothing to hide!" I chose that line because it really reminds me that I don't have to be perfect and that I should always stay honest with myself and others. What about you guys? 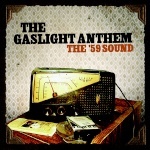 What Gaslight lyrics have really spoken to you and meant something to you? Or just your favorite Gaslight lyric? That is such a hard question. So many parts of so many songs remind me of amazing things, or some of bad things, or some of just things I can relate to. "Stay the same don't ever change" - I like it since it isn't possible, and it recognizes that people do change over the course of their life (it could be very quick, or be gradual). "The ideal angels twist and turn, ask forgiveness for future mistakes." - You can't connect the dots looking forward, but you easily connect them looking back. "And how much time do you think that we have?" - Obviously this is about starting over in a relationship, but it really makes you think about how fast time is. Really, how much time do we have? No one knows. "Does anything still move you since you're educated now? And all grown up and travelled so well" - People are easy to judge by age, or looks, or whatever. The reality is it is irrelevant, and a bad generalization. Try hard not to assume anything about anyone, because you have no idea where they came from or what is happening (or has happened) in their life. I could go on and on, but that is a start. While the gravity hangs on all the selling points you had. Your physical attributes will only last so long,then what? jonester wrote: While the gravity hangs on all the selling points you had. Your physical attributes will only last so long,then what? That is his favorite lyrics, from The Queen of Lower Chelsea. Oh right. Haha sorry I'm not to familiar with that song.